Rinpoche is currently in Taiwan, where Rinpoche is teaching and giving initiations including Yamantaka and Most Secret Hayagriva, till April 8th. Rinpoche’s next teachings are scheduled in Singapore between May 7th – 21st, followed by teachings in Malaysia (including a short Tara retreat) between May 23rd – June 4th. During a recent visit to Sera Je Monastery, Rinpoche and a group of high lamas, including HH Ling Rinpoche, spent a month receiving the lungs of the texts of Kachen Yeshe Gyaltsen. Lama Zopa Rinpoche requested this very rare and important lineage and His Holiness has said that these and the lineage of the great 5th Dalai Lama are very important to be preserved. Khyongla Rato Rinpoche is the lama who gave the transmission and passed on the lineage, he is 84 yrs old. This event was hosted by Osel Labrang. Rinpoche took every opportunity to utilize the time of the Lama’s attending the lungs at Sera Je. Nearly every day as they finished the lungs, Rinpoche would have something to request them to do, like blessing these beautiful appliquéd thangkas which were used to decorate the stage for His Holiness’s teachings in Mumbai. The thangkas are of the most important Indian pandits of Nalanda Monastery. A collection of touching, humorous and illuminating stories about the endless activities and efforts of Lama Zopa Rinpoche, including the koala and millipede sadhanas and extensive offerings of one’s French fries. 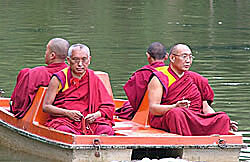 Lama Zopa Rinpoche and Dagri Rinpoche on a blessing the water and fish expedition. 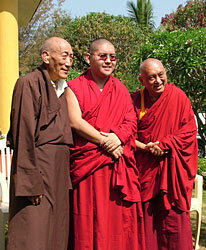 Rinpoche and Dagri Rinpoche are quite close and discuss a lot together, especially about the preserving of lineages. 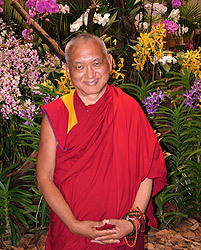 Lama Zopa Rinpoche is the president of the Sera Je Tulku Society that is responsible for preserving the lineages of Lama Tsongkhapa. Kyabje Kirti Tsenshab Rinpoche, a great yogi with skies of qualities, who unfortunately recently passed away. Rinpoche was not only a great scholar of the words of the sutras and tantras, the extensive Buddhadharma, but a great yogi who had attainment of the whole path to enlightenment. The Real Chöd Practice – When somebody tells you something that really hurts your mind then that is the most beneficial thing for your mind, because it goes straight to your ego – it goes straight to your heart and touches your ego. The Need for Organization – There is a need for organization in order to be able to help others, to be able to help more sentient beings. As an individual we can’t do much. We need to be organized. Rinpoche recently said that an absolutely essential part of a Long Life Puja is the 16 Arhant prayer. Rinpoche said it is not an optional prayer and it is vital to do during a long life puja because we are relying on the 16 Arhants for the Guru’s long life. 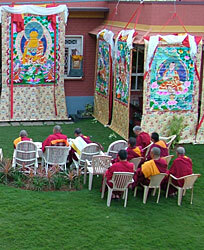 Also the lama’s long life prayer is not optional during a Long Life Puja to that lama, it is essential. Rinpoche advised that we must recite the 16 Arhant prayer and then the lama’s long life prayer. Then while people are going up for blessings, the lama’s long life prayer or the optional prayers people can be continually recited. NB: The FPMT Education Dept will be putting out a new version of the Long Life Puja with this incorporated later this year.